Located in the province of Jujuy, extending between the capital San Salvador de Jujuy to the south and the border with Bolivia to the north, the Quebrada de Humahuaca is one of the most picturesque places in the world. Its name translates to the “Humahuaca break,” a canyon carved through the mountains by the Río Grande. It is a part of the puna, the Argentinian altiplano or high plateau; up there, you are at the doorsteps of the Andes. 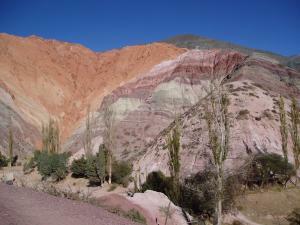 The Quebrada de Humahuaca is located at the very northwest tip of Argentina, in the Jujuy province. It is a zone of altitude, a part of the Andean high plane. It extends over 300 km along the Río Grande, from the capital city of San Salvador de Jujuy to La Quiaca at the Bolivian border, flanked on both sides by the province of Salta. The distance from Buenos Aires to La Quiaca is over 1,800 km; from the Bolivian capital of La Paz to the border, there are close to 900 km; and if you are crossing into Chile, the distance from Pumamarca to the salt flats of San Pedro de Atacama is 470 km. This page rendered in 0.262 seconds.